Documenting the journey of my passion for food. 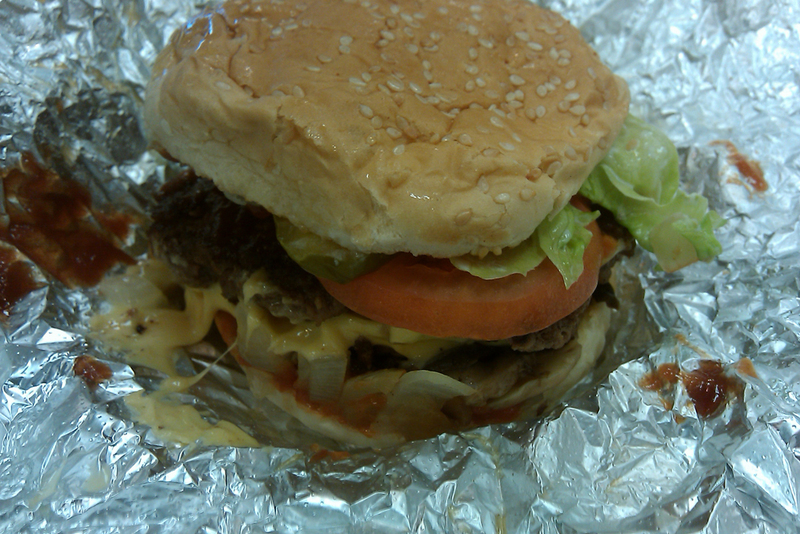 I was commenting to someone just the other day about how Five Guys hadn’t made it onto my blog yet. I have frequented the place quite a few times already, and have eaten at other locations before. Well, better late than never. 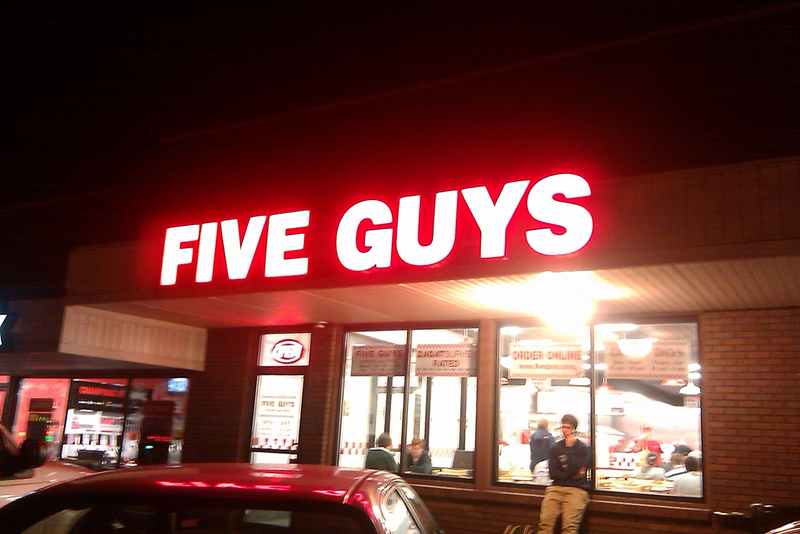 The Five Guys location at Chauncey Hill has been open for almost two years now. I still remember when I saw the signs go up that they would be opening one at Purdue and how excited I got about the prospect of being able to chow down on the immensely delectable burgers and their heaping portions of fries that they are known for. This particular location is open into the AM hours on some days (I think Thursday – Saturday), so even if you’re out and about at odd hours you can still grab something warm (and filling) to eat here. Fellow burger connoisseur Kyle Loux and I recently took a trip here to enjoy some of the aforementioned meaty goodness. One of the great things about Five Guys’ burgers is that they have a ton of toppings available that you can put on there. Ranging from lettuce to grilled onions to barbecue sauce to mayo, there is a huge array of possibilities. I usually top mine off with mayo, lettuce, tomatoes, pickles, grilled onions, grilled mushrooms, ketchup, and mustard; this past time, I stepped out of my comfort zone to add in some barbecue sauce into the mix, and boy, was it tasty. All of the patties are cooked well-done, and there is something to be said about how fresh the meat tastes. Putting it together with everything else on top of it, and their burgers really are something to die for. Although when mentioning their burgers you also have to add in their fries to the mix as well. 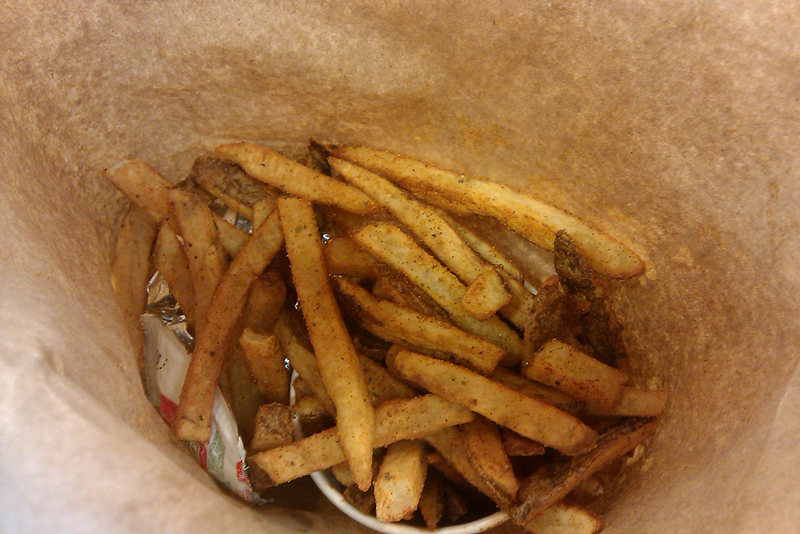 Fresh-cut potatoes and right out of the deep fryer, the fries are coated with either salt or a mix of cajun seasoning. I personally like the extra kick that the cajun gives to the fries, so I usually get those every time. It’s pretty funny because not only do you get your order of fries from the cup, the employees also throw in another half scoop of the fries into your bag as well. That’s a meal that’s enough to feed two people, which is absolutely nuts. I am well aware of the constant battle between Five Guys, In-N-Out, and Shake Shack fans about who has the best burger, but I can say that I do enjoy the overall taste of Five Guys’ burger over In-N-Out (some people might want to hurt me for that comment), but I haven’t tried Shake Shack yet so I can’t say for sure. All I know is that Five Guys has always been a dependable source of a great tasting burger and some excellent fries as well. Even though the burgers do get messy sometimes, the taste is fantastic, and the customization of toppings gives you a load of options to choose from to mix it up. The interior of the restaurant is pretty uniform throughout the three locations that I have been to: white walls, brightly light interiors, and smells just like peanuts (they use peanut oil to fry and there are boxes of peanuts open for diners to munch on while they wait for their food). I’ve always had a really low turnaround time from when I placed my order to when I got my food, and that’s a really big plus. With looking at all of the food as well as smelling it, you’re going to be hungry real quick. Some people might say that the food leans on the more expensive side, but considering just how much you get for the price, I think it’s pretty reasonable. 102,492 hungry readers have visited!